What exact word do you think will fit in for chatori?? to be ground into a powder..
roast everything separately and grind together to make a powder , or paste if you find it difficult..
Heat oil in a pan and throw in the cauliflower florets and half of the ginger julienne ... stir fry on low heat as the oil is less.....add salt and cook covered till done but crunchy . 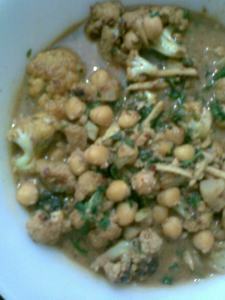 chickpeas and cauliflowers in a hot gravy.. Absolutely delicious. Surely your garlic is growing nice. Totally agree on Chhole! such a versatile, delicious and healthy dish. Garlic pods are doing great! How nice that you have that plant growing indoors.. lovely. 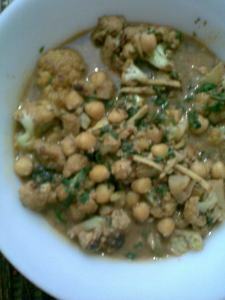 I never tried cauliflower and chickpeas always do that combo with green peas.. will have to try your version some time. Very healthy and filling combination Sangeeta...looks tasty...where do you get the coconut fiber, in any regular grocery? hey nice and spciy recipe. never tried sesame and peanuts!! yummy..
thats a real north meeting south kinda dish. love this combo. hey sangeeta!! 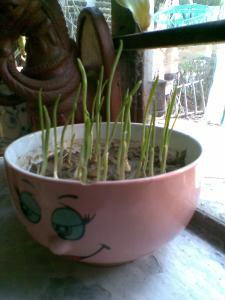 nice garlic plant - this weather's great for roots and shoots! gobhi with cholle i something new, never tried it before. but yup i loved your blog, lots of yummy north indian food here. having grown up in north india - north indian khana was a part of our kitchen. but still havent perfected punjabi homestyle rajma and cholle. i have got a pretty decent recipe now, but no not perfect! nice and healthy dish!! nice! 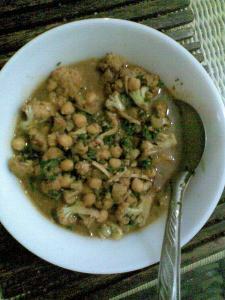 Wow...Chole and gobi combo...very new to me...U always come out with some healthy ones...great going :). Thankyou everybody for the appreciation , my garlic plants are so happy with all this adulation !! @Aux delices des gourmets ..many thanks for the complioment ...welcome on my space and merry Christmas to you all too !! Hey nice curry...loved the combination of spices and ingredients used.Never tried cauliflower with chickpeas, vl try it sun.